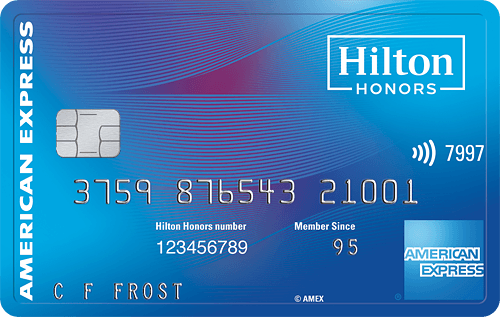 Hilton is considering adding the ability to cash out Hilton points for Amazon credit at a rate of 0.5¢ per point for cardholders of the co-branded Hilton cards. The standard rate is currently 0.2¢, but twice recently it has been temporarily increased to 0.5¢ for a brief period. The survey specifically mentioned this as an option on the no annual fee version Hilton American Express card as well. 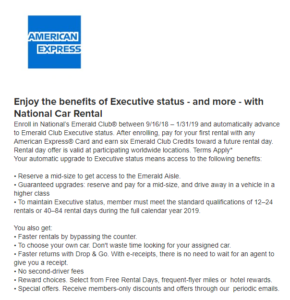 National car rental is offering free executive status until 2/28/2020 for American Express cardholders that aren’t currently National members. After completing your first rental using any American Express card, you will also earn six Emerald Club credits towards a future rental day. 12/21/2018 update: New round of offers has gone out, check your e-mails to see if was targeted. American Express are currently offering selected charge cardholders 10,000 points when they enroll Extended Payment Option. This offer is targeted, but you could use following links to check if your charge cards are eligible for enrollment. You don’t actually need to use the pay over time feature to get the 10,000 bonus points, you must simply enroll in it. American Express today announced it is eliminating the requirement for merchants to collect Card Members’ signatures for all purchase transactions at the point of sale beginning in April 2018. The move, which applies globally to all American Express-accepting merchants, will help provide a more consistent and simplified checkout experience for merchants and Card Members in regions around the world, speed up the process of paying in store and help reduce merchants’ operating expenses associated with retaining signatures. The elimination of American Express’ signature requirements will apply to purchase transactions of all amounts at the point of sale. American Express is the first payment network to announce this change globally, expanding previous policy changes it has made in various regions. For example, American Express has already eliminated signature requirements for transactions at the checkout that are under $50 in the U.S., under $100 CAD in Canada, and under £30 in the U.K. In regions outside the U.S. where signatures are already less common, this change can help provide a more consistent checkout experience for Card Members traveling from countries where signatures are more common. Once this change takes effect in April 2018, merchants will still have the option to collect Card Members’ signatures at the point of sale if they choose to do so, and must continue to collect signatures if they are required to do so by applicable law in a particular jurisdiction. Mastercard and Discover made similar announcements, all with the same April 2018 timeline for implementation. 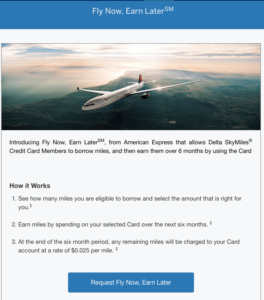 American Express increased Amex Delta Reserve Card signup bonus- 40,000 Delta miles and 10,000 MQM (Medallion Qualification Miles) after spending $3,000 within 3 months. Spend $30,000 or more in a calendar year you receive 15,000 bonus miles and 15,000 MQM; Spend $60,000 or more you’ll earn an additional 15,000 bonus miles and an additional 15,000 MQM. Get 2x miles on Delta purchases and 1x miles on all other purchases. $25,000 spend across all American Express Delta cards currently results in a MQD waiver through Diamond Medallion. Delta Sky Club access, but can’t bring guest for free. In our opinion, unless you need MQM to get or keep your Medallion elite status, this card doesn’t worth to apply. You could apply Delta Gold Card and Delta Platinum Card to get signup bonus and benefits such like free first checked bag, priority boarding and so on. American Express has launched a new program for Delta cardholders called Fly Now, Earn Later. 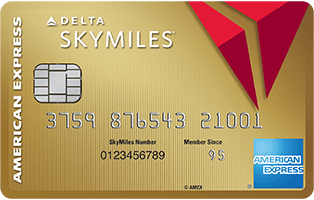 This allows American Express Delta cardholders to borrow miles and then earn them back over a period of six months. The amount of miles you can borrow is tied to your spending patterns. If at the end of the six month period you have any remaining miles still owing you pay 2.5¢ per mile. Amex Offers is a great way to make a bit of additional money without too much work, that provides bonus Membership Rewards (MR) points or cashback in the form of statement credits for shopping at particular merchants. The offical way to keep track of AmEx offers is through the http://www.amexoffers.com/ website. Here are the methods to enroll the offer. Account page: Available offers are displayed below the current statement charges for each Amex account. All you have to do is click on the offer and it will be loaded onto that card. Twitter: Only one card can be registered with one Twitter account. All you have to do to enroll is retweet the deal. Ex. #AmexSaks. Amex will respond with a confirmation tweet that they have loaded the offer to your card. Facebook: Search for Amex Offers, and it will bring up the App. You just need to enter your card information, and then any offers you select through Face book will be linked to that card. The new American Express Platinum Card launched today, featuring a new benefit of a $200 annual Uber credit, as well as Uber VIP status. Any Platinum Card holder who has their card linked to their Uber account will automatically receive the credit. 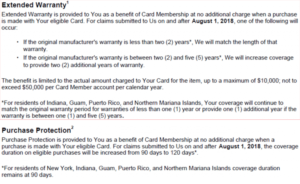 Amex breaks the $200 down into 11 months (January-November) of $15 worth of credit and one month (December) of $35 worth of credit. All of which expire at the end of the respective month. In order to take advantage of the $200, you have to have the card linked to your account. Note that you don’t need to use the card to pay for your ride, it just needs to be linked to your account. 4. Once your card information has been entered, you’ll get a notification that you’ve unlocked the benefit. American Express Membership Rewards (MR) is a popular rewards point system. As my opinion, it is one of the most undervalued ones in the United States. MR points can be used for all kinds of stuff, from gift cards to TV’s to airline miles. The best part about the program is that you can transfer MR points to other loyalty programs at any time, so the miles can be where you want them when you need them. How to earn MR points? Usually, for most people, credit card sign-up bonus is the fastest way to earn MR points. Check here to see the public sign-up bonus for each MR rewards card. For spending rewards, different card has different rewards rate. The following is the spending rewards of each card. AmEx Everyday: 2x points at US supermarkets and 1x points on other purchases. Use your Card 20 or more times on purchases in a billing cycle and get 20% more points on those purchases less returns and credits. AmEx Preferred Everyday: 3x points at supermarkets, 2x points at gas stations and 1x points on other purchases. Use your Card 30 or more times on purchases in a billing period and get 50% more points on those purchases less returns and credits. AmEx Premier Rewards Gold: 3x points on airlines, 2x points at US restaurants, gas stations and supermarkets, and 1x points on other purchases. AmEx Platinum: 5x points on airlines, 1x points on all purchases. AmEx Green Card: 1x points on all purchases. AmEx Gold Card: 2x points on airlines and hotels, 1x points on other purchases. You can do this one of two ways, either save on travel by booking directly through the American Express website or by transferring your points to one of your favorite hotel or airline loyalty programs. If you has The Business Platinum Card, you could chose first method because the Business Platinum Card cardholders get a 50% Airline Bonus when using MR point to book air tickets. The first way to shop with your points is through the Membership Rewards shopping site that includes about The first is through the Membership Rewards shopping site, that includes 50+ stores spanning many different categories. For most of the products listed, you’ll be receive a points “discount” making each point worth .625 cents. A few items are not discounted this way in which case each point is worth .5 cents each. So I suggest you NOT to use your MR point for shopping. American Express breaks their gift cards into a couple of categories: Travel, Retail, Dining & Entertainment and American Express gift cards. For Retail / Dining & Entertainment gift card, the value is 1 cent per point, for Travel gift card, the value is about 0.8 cent per point, and for AmEx gift card, the value is about 0.5 cent per point.